DIY or DIE? DIY or Call an Expert? Today there is a whole business model teaching people how to do things themselves, especially when it comes to DIY home projects. My husband and I love doing small DIY projects around the house. We actually own a business that does just that for art! My husband and I own a Wine and Canvas franchise here in South Dakota, where we teach people how to create art during a class. The customers can also enjoy an adult beverage to help loosen up our clients! I usually buy canvas from our supplier, Michaels.com. We recently started painting on wood pallets, and this has me out of my comfort zone. I decided that instead of losing a finger with me trying to use a saw cutting up the wood pallets for our wood, sand, stencil and paint classes, I would hire it out. I believe that in this case not doing this small DIY project is a good idea. I don’t own a saw and I certainly didn’t want to invest in a saw and build the pallets for our classes since I am quite frankly, ‘all thumbs’. Hiring this out gave me the ability to pay a low rate and not spend my time breaking down the wood and assembling it into our project wood pallets. While it would cost me no money to actually tear down and put the pallets together, it would cost my time, energy, and I don’t own a saw! This all translates to money in the bottom line of our business. If I am spending my time making wood pallets, I am not taking phone calls, booking parties or building up our business! Sometimes it is much more cost effective to bring in the professionals! I work the same way at home as I do when it comes to my business. If doing the project myself is something I believe I can tackle safely and cost effectively I usually will give it a shot. However if there is a chance I am going to get injured or it will take an excessive amount of time to complete, I will usually bring in the professionals. When do I consider it safe to do DIY home projects when it comes to fixing things around my house? Well as I mentioned I am ‘all thumbs’ and so fixing things by myself is a fairly short list. Light bulbs, yes I can change those. Not all DIY home projects and house maintenance work could end in your own demise, but it is safe to say anything is possible! I have caulked my tub on my own. I have painted rooms, broken and fixed the garbage disposal, torn up carpet, removed a chimney, installed a new kitchen floor, built shelves and probably some other really low maintenance fixes around the different homes I have lived in. Cleaning around my house, that is generally a safe call. However it wasn’t at a safe call at least once in my life! I actually almost DIED cleaning! Short story here, but I was a teenager living at home with my parents and I decided I had a stressful day at school and wanted to relax in the bathtub. I went to start the bath, and EW it was gross. I needed to clean the bathtub. Well I started looking around the bathroom to see what I could use to clean it with. Bleach yeah, that will clean it. I pour some in to the tub. I put it back under the bathroom sink. I then see something called ammonia, hmm not sure what that is, but it is right next to the bleach, it must also be good for cleaning! I pour some into the tub to start scrubbing it down. ** Next thing I know I am coming out of a fainting spell on the bathroom floor. I had knocked myself unconscious. The windows in the bathroom were open clearing out the air. Turns out mixing those two chemicals created a poisonous gas that is deadly. I was lucky and with the windows open the fumes cleared out and I was able to come to. However if those windows were not open I would have accidentally killed myself, just from trying to clean the bathroom tub. Long story short, I wanted to clean the bathtub to take a bath, but nearly killed myself trying. It may be a good idea for me to hire a maid! I usually know when a fix is over my head and I should call in an expert. I know just about anything electrical should be handled by a professional. Just two nights ago I went to pull a chewed up extension cord out of the wall and electrocuted myself. It was a short quick buzz to my fingertips. I grabbed the end with exposed wires. Granted I wouldn’t call an electrician to unplug my extension cord, but it does show you why I wouldn’t want to do any electrical fixes around the house myself! Here is a short list of small DIY projects I’ve needed fixed around my houses that some people would actually do it themselves, but I required a call in to the professionals: Repairing or replacing my fridge, repairing my roof, replacing window screens, garage door repair, locksmith, water damage, water heater issues, air-conditioning issues, plumbing and tree removal. I am sure there are more times I have called in a professional to fix something! I will call in a professional when it looks like it will take me hours to fix something that a professional can do in less than one hour. My time is not worth trying to fix a disposal for 4 hours when a plumber can fix it in less than an hour. 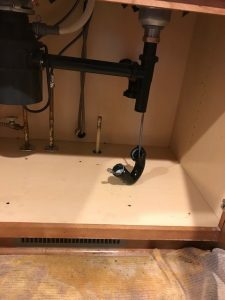 Last time I tried to DIY to fix a clogged up kitchen sink I ended up popping the pipes off. They were fitted instead threaded. This meant that all the food, water and waste that was built up in my sink ended up on my kitchen floor. I had also just used Liquid Plummer. It had bleach in it and bleached my clothes and kitchen rug. I was done. It was time to call in a professional. While waiting on the plumber to come fix my sink I got to change clothes and shop online for a new kitchen rug. The service call to the plumber was like $117, my DIY home project cost me a pair of jeans $35, a shirt $15, a kitchen rug $45, and a snake drain from the hardware store $20. So my attempt to DIY the kitchen sink effectively doubled the cost of the ‘fix’. In this instance I could have saved myself time, energy and money if I just called a professional first! I have been lucky enough to even save money on service calls for some repairs and maintenance in my home by having a home warranty that covers home appliances like fridge, stove, oven, microwave, dishwasher, disposal, washer, drier and even my home heating and cooling system. 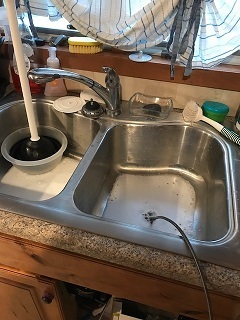 The service call to the plumber for my kitchen sink was $117, however if I had called in the repair through my home warranty it would have only have been $75. I did not call them in because I knew what happened to my disposal and it was a ‘user error’. I had dumped a pot full of spaghetti noodles in the disposal and it gummed it all up… So the repair would not have fallen under the home warranty clause, but if it weren’t my fault and the disposal quit working it would have been more cost effective to call my home warranty provider and have them send out a service person for the repair.